Oh I love this concept! There's something so wonderful about using family recipes and it looks like it is explained so well in this book. I'll definitely have to get this book. I like that it has the recipe in the back so my son and I can make it after we read the book. Sounds like a good book to read aloud, because it may not be one that kids would gravitate to on their own? I don't care for blackberries, only raspberries, but I imagine you could substitute other berries for the blackberries in the recipe, too. I love this book and featured it at Alphabet Soup a few weeks ago. Even made the blackberry fool, which was yummy. I love this. 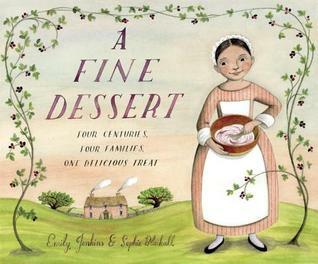 Food history and people history all wrapped up in one book - with a recipe. And that blackberry fool sounds delicious. This sounds so sweet. I love blackberry fool and love the idea of a recipe connecting us through the ages.